I open my eyes in the morning, and the first thing I see is my vision board; I have been creating these for several years at the turn of the year, and then they hang in my bedroom. The year 2017 will end soon and when I look at the picture opposite my bed I see that this year was exactly the way I created it on my vision board. It brought many challenges, which were hidden in the innocent wishes as well as great surprises that life had laid in my path. It was the similar case even in the previous years, at least 90% of what I pictured had always happened. And as you can imagine I didn’t have small goals. 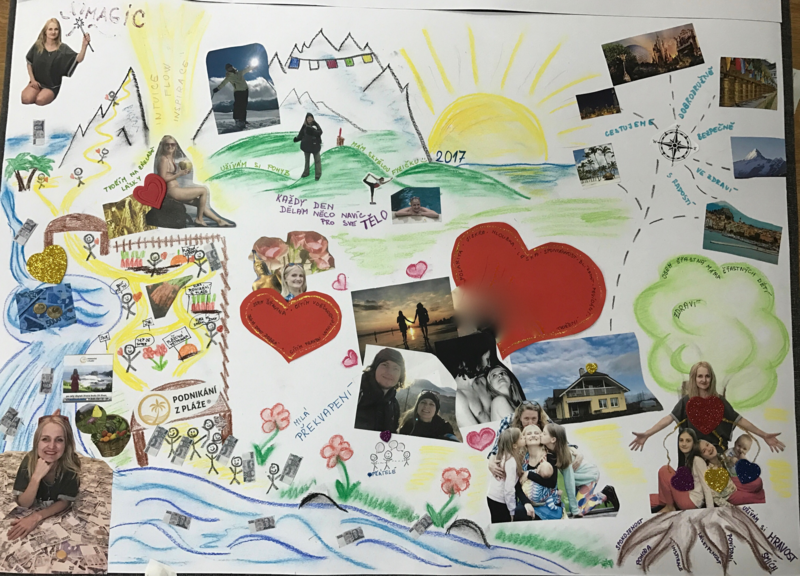 :) Here is my vision board, it is in the Czech language, but you get the feeling from the pictures. 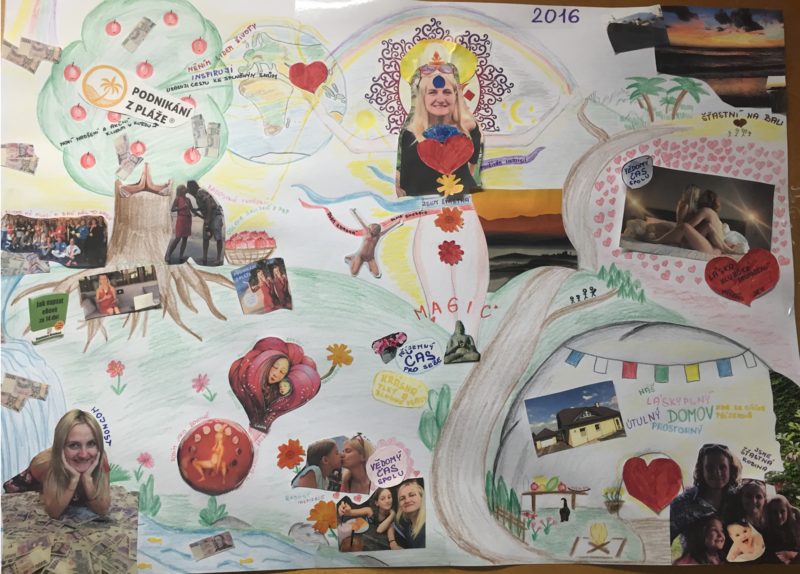 Magic hidden in vision boards? Or something different? I love magic and rituals but at the same time, I believe, they are just the icing on the cake, the last part of the already made machine, which is essential for getting the machine to start and work smoothly. But 99% is hidden somewhere else. The secret of why my vision boards work year after year is the DECISION. I always spend the last days of the year balancing things. I evaluate my successes, joys, and amazing experiences as well as the difficult times, downfalls and lessons learned. I think about what I want to bring to the following year and what I want to leave behind in the old year. I make decisions what I change. I give it a high care. I write, cross, add. I carefully choose words and pictures I want to express the following year with. I have learned to pay attention primarily to how I want to feel. Because it’s not so important whether you are traveling the World and rest in millions or if you are walking in the forest and rest on the grass. What matters is HOW YOU FEEL WHILE DOING IT. Do I really want it like that in my life? Can I fully commit to this? Am I decided to change things? Am I decided to change myself? Am I decided to risk and leave the well-known? I often set myself big goals and I accept the full RESPONSIBILITY for achieving them. And then the life starts spinning fast and because of some goals, it often doesn’t stay the same anymore. The year flows, and I accept new challenges as they come. I laugh, and I am thankful. So I could fulfill my decision. And then I look back at all the random opportunities, ideas I wanted to pull out of, significant challenges and pleasant surprises; this all suddenly makes sense and these pieces create the whole picture of the past year. Vision board is good because I can always see my decisions for the particular year. But a written text you just hang above your desk or a small note you insert in your purse could do the same job. When you clarify your decisions, and you can see them every day, it’s much easier to recognize opportunities and little sidetracks that suddenly appear and you much better cope with the storms that are the necessary part of the change. Recap your dreams and desires for the year 2018 and change them to DECISIONS. But it isn’t so easy! It’s often because I am trying so hard to “come up” with a solution, and for all the thinking I am missing out opportunities and possibilities that life prepares for me in the meantime. The paths towards our dreams lead across lands we can’t even imagine. And if we can’t see the solution it doesn’t mean that it doesn’t exist. Hence, it’s not important to always conjure the HOW. But to know WHY I want it, what qualities it will bring to my life and WHAT I really want. AND TO MAKE THE DECISION that I really want this and I will simply find the way. And then to follow with faith what life starts serving to me. You may get fired from work, you may break your leg or get ill. Sometimes life can be so tough when it leads us towards our dreams and wishes. It’s not that easy. If it was so then everybody would have their dreams and wishes fulfilled. If you want something, it's necessary to clarify how much you are devoted to it and if you are willing to accept also the other side of the coin; that you may have to give up something or somebody, leave your old habits or your current lifestyle. And to decide you will go for it. That it is important for you and you accept the full responsibility for everything what your dream or wish brings. It doesn’t matter who I am, what I’ve achieved and what I got. The most important is how I feel. And since then I formulate my goals and wishes completely differently. Quite a nice example is my vision board for the year 2016. Sorry, it’s in Czech, but my native language feels much more appropriate when creating these. Instead of writing “Summer in Bali”I have scribed “Happy in Bali” on my vision board in 2016. Instead of “Good health” you would find “I feel healthy and full of energy” there, etc. 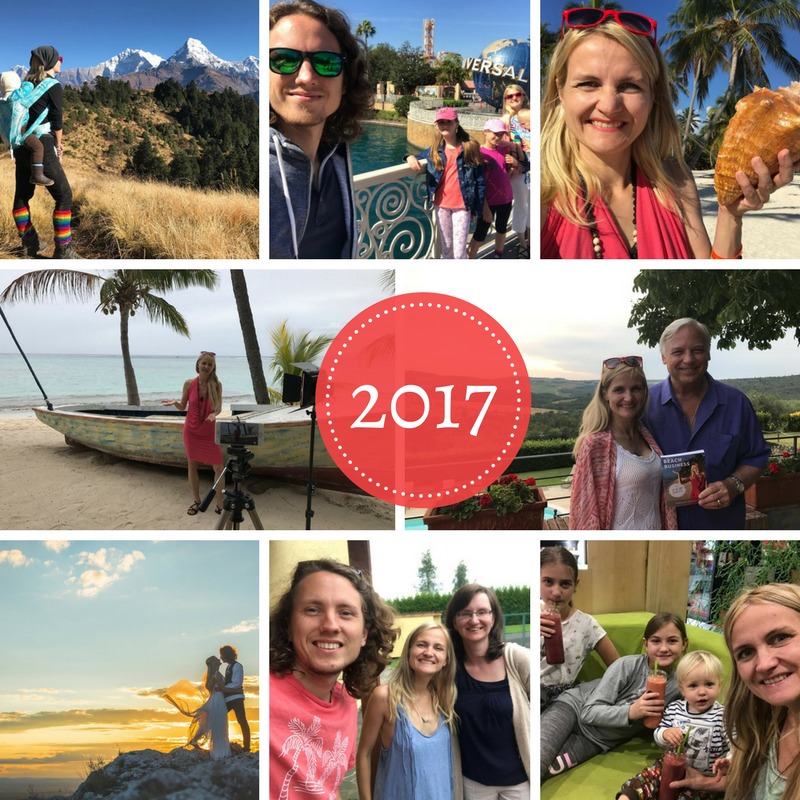 I fine tune this every year so even this year I have learned from some of the imperfect formulations and thing that I have stated in a way that I was nearly banging my head on the table saying “Omg, what have I made up for myself…? ?” :) But this is the part of the game called LIFE. Therefore, my advice at the end is: Think about how you want to feel in specific areas of your life in 2018. Do you want to earn 4000 euros per month? Why? What will you feel like? Do you want to spend the whole winter in Thailand? Why? What will you feel like there, what will you experience? Do you want to get pregnant? Why? How will you feel? Do you want to start a business? Why? What feelings will that bring to your life? Big changes require time. A tree won’t grow from the seed overnight, the same as some big visions and dreams need to grow and mature. There may be wishes their power fades off over a time, and they won’t be important anymore. And it doesn’t really matter. It’s important to know where I am now and where I am aiming. Then the journey finally starts making sense, and we can get to our destination. Therefore, I have prepared worksheets for you. Download them by clicking on the link below (no need to sign up), print them out and give yourself and your plans time for the following year. DOWNOLAD here (no need to give email) - The Map For Your Journey in 2018. These are worksheets thanks to which you can conclude your year 2017 and plan your journey through the year 2018. Research shows that more we appreciate our PAST SUCCESSES, more reassured we feel when accepting other risks and managing them successfully. lives her life to the fullest and makes her dreams come true, even the craziest ones, every day. A few years ago, she decided she didn't want the days to pass by in vain like sand in an hourglass. She is a woman, a mother of two daughters and one son, a partner of a great man, online marketing expert and a successful entrepreneur. Stania is an author of a Beach Business book, Beach Business online course and an eBook From a Stressed Out Mother to a Beach Entrepreneur. She inspires people how to live freely, happily and to the fullest. Teaches them how to use the potential of the internet and online marketing, so that they can start a journey of their dreams and run their business from a beach. Your personal data (name, e-mail address) are safe and I (Beach Business, Na Nábřeží 231/6, Havířov, Czechia, IN: 01749587) will process them with your consent according to the personal data protection principles, which come out of the European legislation. By clicking on the button, you express your consent with this processing, which is necessary for being able to send you the eBook and following e-mails related to the topic from me. You can cancel your consent anytime by clicking on the button UNSUBSCRIBE in every received e-mail.